Written in accordance with the latest revision of the geometric dimensioning and tolerancing (GD&T) stanedard, ASME Y14.5-2009, this book teaches the principles and practical applications of GD&T in an easy-to-understand manner. 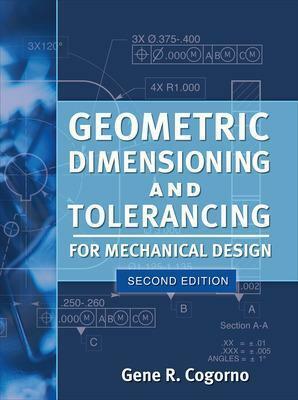 Geometric Dimensioning and Tolerancing for Mechanical Design, Second Edition, begins the discussion of each control with a definition, and then describes how the control is specified, interpreted, and inspected. Detailed drawings illustrate the topics discussed. Study questions and problems at the end of each chapter emphasize key concepts and serve as a self-test. Ensure the proper assembly of parts, improve quality, and reduce costs with help from this authoritative resource. Gene R. Cogorno is a professional educator, speaker, and author with more than 30 years of experience in education and training. He teaches courses in geometric dimensioning and tolerancing and tolerance analysis and instructs technical courses in blueprint reading fundamentals and inspection techniques.